I harvested the last of the potatoes in the raised bed. However, I think there are probably a few more deeper down. I will have to dig early tomorrow. It's too hot in the afternoons to work in the garden. So many of the little seedlilngs are coming up: zucchini, cherry tomatoes, Brandywine tomatoes, squash, Swiss chard and kale. I want to plant more today and tomorrow: basil, more peppers. The corn and beans will be planted directly in the garden, as will the lettuce, spinach, arugula. Get busy Linda. Lots to do. This Saturday I hope to get in more of the drip system. Rodney said he will help. Hopefully I will get a few gardeners, too. It's finally getting warm so I've got to hustle. Worked by myself in the garden today. It was really wonderful--very meditative. I started out by watering the strawberries. I am going to have strawberries this year if it kills me. Then, I added a bag of leaves from the big tree that I have been keeping in the garage. I think I have 5-6 more bags. I cultivated the hillside where we planted the zucchini and squash. Then, I decided to water the hillside--disaster! More later. I have company coming for dinner! So yesterday afternoon I received 10 million beneficial Nematodes in the mail. I received 5 million a few days ago. Oh well, a little mixup I guess. Anyway, that meant I had to wet the ground, spray the Nematodes and wet the ground all over again. And use the backpack sprayer again, of course. Can't waste the Nematodes. Hope they help this year. Got up early again to start the gardening. Rodney and I set up one long line of soaker hose around the perimeter of Garden #1. I have to get more T connectors so I can set up the individual lines or rows for the vegetables. Then Rodney pruned one of the avocado trees, which was in dire need of pruning. Rodney pulled open one of the compost piles and washed the container. That corner is now an open compost pile. Juna and I planted seeds in peat moss pockets which you first soak in water and then just plant a seed. When the seedlings are ready for transplanting, you just drop the whole thing into a hole and push the dirt around it. No messing with the roots. We planted kale, Swiss chard, peas and beans. Oh, and great news. Three little seedlings are already up in the small cups I planted last week-- one Cherry tomato and two Beefsteak. Got up at 7 a.m. this morning to spray beneficial nematodes on all the gardening areas. Why? 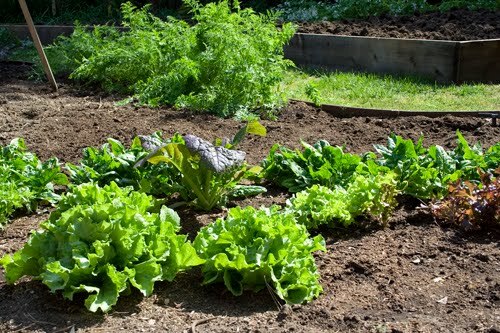 Because last year a lot of the roots for the tomatoes, bell peppers and other vegetables had these bulbous growths on them--bad nematodes, which eat away at the nutrition, quantity and quality of the vegetables in question. The beneficial nematodes eat the bad ones. First you have to wet all the areas (5 gardens, plus the fruit trees in front), then mix the nematodes in water and put into a backpack sprayer, then spray, then wet the areas again so the nematodes enter the soil easily. That took me until 9:15 a.m. A good mornings work! The garden is empty now, but ready for all the transplants I am starting. Rodney showed up at 8 a.m. as did Rene and Bernard. Pulled all the vegetables out of the garden except for the potatoes in one corner and the mint in another. 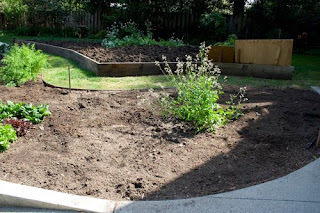 Moved the 7 cubic yards of soil into all the beds after loosening the soil already there. We worked really hard. Romaine, Lu and Juna showed up a little later and helped us finish up. 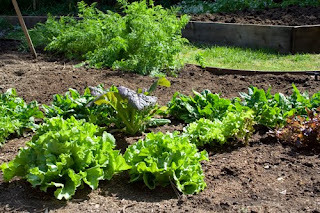 In addition Romaine and Lu planted zucchini and squash all along the hillside garden. 9 mounds, 3 seeds in each. It was their first time planting squash and zucchini. They had a good time. Then we had a barbecue-hot dogs, cole slaw, potatoe chips, fresh cut vegetables, brownies, lemonade, Coke, wine and beer. Romaine brought veggie burgers and made a wonderful dessert right here in my kitchen-strawberries stuffed with cream cheese whipped with a little vanilla and powdered sugar. Then topped with crushed graham crackers. Yummy! I am going to put the recipe in my cookbook. Even though it's officially been spring for a while, the garden has been in winter mode. 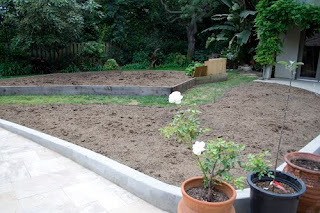 Today, Rodney pulled out all the soaker hoses in Garden # 1 and the Raised Bed. Then we harvested most of the vegetables still in the garden, in preparation for the 7 cubic yards of soil arriving Friday, midday. Rodney, Juna and Michiko helped me harvest green onions, kale, carrots, lettuce, spinach, arugula, Swiss chard, parsnips and the last of the peas. We also shared rosemary and oregano. 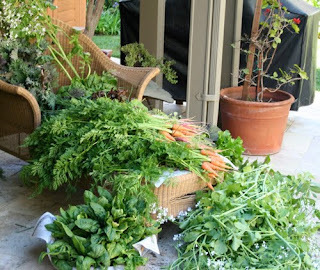 There are still a few vegetables left in t he garden. I will pull all except maybe the potatoes out on Saturday morning and divide the last of the harvest among the workers. It's also time to start the seeds in small containers. I planted Brandywine tomatoes, Beefsteak tomatoes, cherry tomatoes, red, purple and yellow bell peppers, jalapenos, zucchini and yellow squash in a mixture of potting soil and pure mycorrhizal inoculant. Then I watered well with water mixed with Super Thrive and Actinovate. Put the whole tray of containers on the heating pad in the south corner of the house. I will turn on the heating pad tonight, which will keep the veggies 5 - 10 degrees warmer tonight. 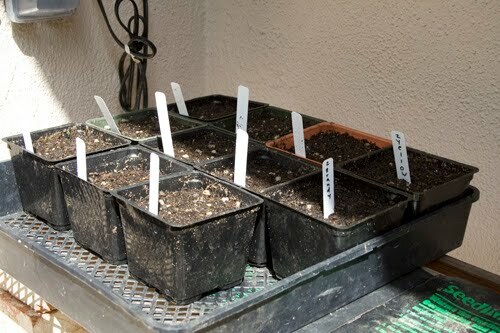 Most of the vegetables will germinate in 7 - 10 days. Juna and I got a lot done today. We harvested 10 lbs of potatoes--Yukon gold, fingerling, mmm good. I will have potatoes baked with fresh rosemary, sage, salt, pepper and olive oil. Can't wait. We pulled down t he walls for the potatoes. One area in the raised bed is still standing. I will leave it. Added soil to the strawberries on the hillside. Harvested green onions, chives, kale, Batabian endive, arugula and Royal Oak leaf lettuce. The soil is ordered. Just getting ready. Lots to do tomorrow. I have just ordered 7 cubic yards of soil to be delivered next week. Have to harvest what I can, move the tomato support, decide what I can replant, think about the soaker hoses. Then, I should start some of the plants in the small containers on the heating pad in the south corner of the house. It's time! Time to start getting ready for the summer garden. Tuesday: Order soil for garden. Order more rather than less. It costs $200 to send to me. I'm thinking 10 cubic yards. That's a lot, but I'll end up using it throughout the year. Must buy 100 or 50 gallon barrels to store some of the extra, unless I want a pile of dirt in my back yard. Start tomatoes and bell peppers in small containers. Zucchini and the other vine vegetables and fruits. Better check the seed packets and find out how soon they can be transferred to the garden.